If you enjoy Christine's Pantry, tell a friend, family and co-workers! Thanks! Preheat oven to 375 degrees. Arrange chicken in 13x9 baking dish. Drizzle extra virgin olive oil on chicken. Add salt, pepper, garlic powder and rosemary. Making sure to coat chicken. Place in oven, cook 25 minutes, until no longer pink in center, and juices run clear. Enjoy! I love the combination of rosemary and garlic...yum! This does sound like it would come out really moist since it is baked, nice touch with the garlic and rosemary. Thanks for sharing. looks great, christine! 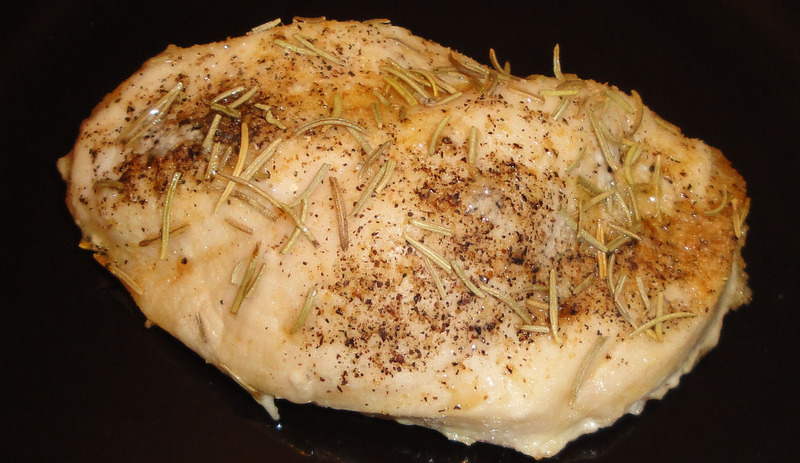 rosemary is one of my favorite herbs to use and I bet this chicken is wonderful! This sounds like a great recipe...I have fresh rosemary growing out in the yard too. I don't think you can get any more delicious and classic! Looks so good! Rosemary and garlic give the chicken such a wonderful aroma and flavor. I can almost smell it now. Great recipe! Sounds great Christine :-) Classic combo! Rosemary is a great combo with the garlic and chicken. Although the fresh ones are a bit difficult to be found where I am, I use the dried ones too. That would be nice to have rosemary growing in the garden. I don't have a green thumb. This sounds delicious, I love the combinations of flavors, garlic and rosemary, very fragrant and flavorful! I love rosemary on chicken, never tried with garlic before. Should be quite delicious! Thanks for sharing! We are interested in exchanging links with your site. We have a Google Page Rank of 3 and 1000 unique users a day. Please add our link to your site with my link information given below and send me the URL where you have placed my link OR Send us your link details if you want your link to be placed on our site first. PLEASE DON'T CONSIDER THIS EMAIL AS SPAM MAIL. Oh Christine, this looks so healthy and tasty at the same time. I will definately give it a try. I like that you used dried rosemary. My husband doesn't mind dried rosemary but he thinks the fresh is too much like "pine needles" even when it's chopped. I only use the dried. Great post. I make this exact thing!! I love rosemary. Sometimes I throw in some fresh sprigs... which are even better. And usually some lemon slices too. Delish!! If you try this, let me what you think. Any feedback is always welcome. Thanks! Can't go wrong with rosemary and garlic on chicken! Rosemary, garlic and chicken.... Lovely, its sounds perfect. Yours chicken sounds perfect and moist.. These are delicious flavor combinations. I'm making rosemary bread tomorrow and now I'm going to be craving a rosemary chicken to go with it! I love rosemary, and this chicken sounds wonderful! I think garlic and rosemary is one of my favorite kinds of combinations. This sounds great! Easy and flavorful. Nice recipe. This looks amazing, I love rosemary & chicken, they go so well together! This flavor combination rocks all the time and this is looking super yum! Rosemary and garlic really do combine for great flavor. I'm sure this would go over well in our house. This is the first year I've grown rosemary, and I'm really hoping I can keep it alive in the house this winter. There's something so nice about fresh rosemary. If it doesn't last, though, I'll just be usin' dried. ;) We'll see! love one dish recipes. looks fantastic! Terrific information on the health benefits of rosemary. I have two plants that I nurture with care. I love it with roasted potatoes too! Just discovered your blog-- love reading the history and info in your posts! This chicken dish looks perfect for fall, which is right around the corner! Welcome! We are happy to have you here.